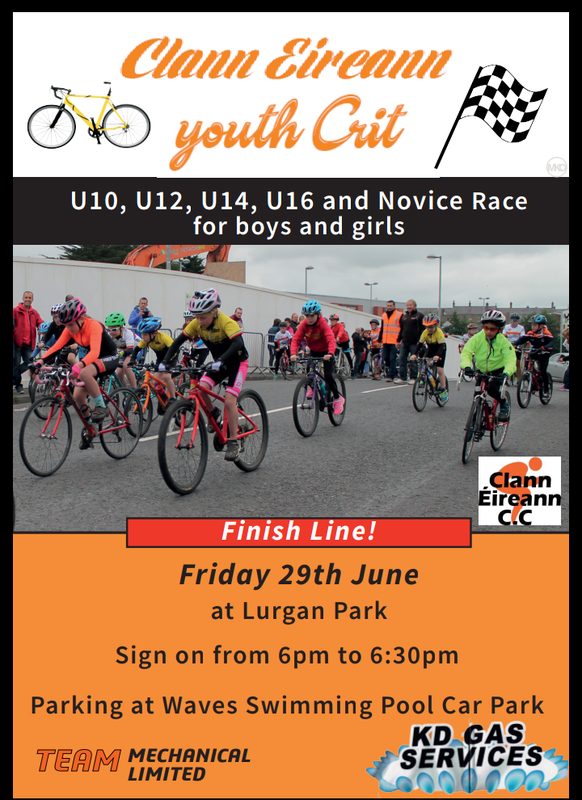 Clann Eireann will be promoting a series of crits for young riders on Friday 29th June. There will be racing for U10's, U12's U14's and16's and both boys and girls will be catered for. There will also be a novice race for beginners. 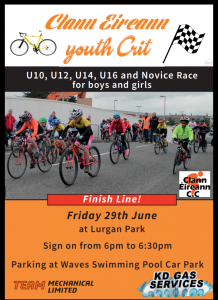 The event will take place in Lurgan Park with sign-on from 6.00pm to 6.30pm. Parking for cars will be at Waves Swimming pool car park. Tomorrow night sees the start of a Fun Crit trio series for youth riders. Phoenix CC, North Down CC and Apollo CT have come together to organise three crits for Youth riders in safe off road venues. Following the success of the 20:20 Cycle in 2016 Alzheimer's Society has again teamed up with Omagh Wheelers CC to launch Dementia Awareness Week in Northern Ireland. With a range of cycling options this promises to be a challenging and enjoyable day, with beautiful views of Tyrone and the famous OWCC hospitality. The 16th edition of the McCann Cup took place in dry, but bitterly cold conditions at Fintona on Sunday 18th March. A record number of entries from across the north and south travelled to Fintona for the popular race sponsored by Ballmore Services. A full suite of races was on offer including Womens, Masters, A4, A3 and the main A1/A2 race. While St Patrick may not have turned over the sunny side of the stone, the bitterly cold weather did not deter riders turning out for the two races held in Burt Donegal and Ballymacash in Lurgan. In Donegal North Pole CC promoted a series of races covering the junior and senior categories. Mark Potts of Neon Velo romped home as winner of the main race while Claire O Neill of Armagh City Cyclists took the women's prize. Newry Wheelers put on a fine display on and off the bikes today with 2 wins several top tens and top organisation. The Wheelers promoted 4 races on the day and all went well.